Dover Castle England is an incredible fortress that perches on the dramatic white cliffs of the English channel. Unlike any other castle in England, Dover has played an important role in British history for more than 950 years. It was one of the first Norman castles in England, established in 1066. Later, in 1216, it resisted French siege; and held strong against the Napoleonic wars of the 1800s. It was even used in World War II as a base for one of Britain’s finest moments: the rescue of Dunkirk. Rightfully, Dover Castle in England is Kent’s biggest tourist attraction and one of the most visited castles in the UK. It’s a great day-trip from London, or stop-off from a ferry to France. It’s also a popular stop-over for cruises touring Europe. I spent a merry day exploring the castle back in summer 2011, and here’s a visitor guide, site history, and a review of the best bits of this fantastic site. Why’s Dover Castle so important in English history? It’s all down to location, location, location. In the narrowest section of the straights of Dover, it’s just 21 miles between England and France: you can comfortably see France on a clear day. Evidently, the castle’s well-placed to be “the guard-post of England”. The round, crumbling tower to the right of the church is a Roman lighthouse, built in AD200. It was probably constructed to guide the passage over the English channel. It’s contained in the curtain wall of the castle. The castle’s incredible strategic location was acknowledged by William the Conqueror; Henry II; the 1770s British Government and even by the British Army in World War I and World War II. Through the ages, each of these individuals and organisations built new parts and strengthened the existing castle. Their overall goal was to keep England secure. How big is the site? What should I expect to see? Dover Castle is huge – around 620 metres between its furthest spur and the Dover cliffs. The entire site is wrapped in one thick ‘curtain wall’ built in the c12th, which is broken by two entrances on its Eastern side – the first break being Canon’s gateway, an entrance for cars; and the second break being Constable’s gateway, which is mainly a pedestrian access point. At the heart of the entire site is the The Great Tower, which is surrounded by the Inner Bailey wall. This is basically a “wall within a wall”, and therefore a second line of defence if the outer curtain wall was passed. The two gateways into this Inner Bailey were originally protected by defensive fortifications, arranged at an awkward angle to make it harder to ‘charge’ the gates. Let’s stop off at the Great Tower – the true centre of the site, and more than 25m tall. This is the Great Tower (or Keep). It bears striking resemblance to the Tower of London’s Great Tower. The Great Tower is Dover Castle in England’s star attraction, and was built by Henry II in the twelfth century. It extends over three levels – which include a banqueting hall, kitchen, store-room and bedroom – and has been beautifully done-up in vibrant colours to evoke the times and life of King Henry II. In peak season, jobbing actors pretend to be King Henry and his courtiers, and give a nice insight into Medieval life. Kids’ll love it. The Great Tower is beautifully restored to reflect the time of Henry II (1200s). The bright paints are authentic colours from pigments of his day. It’s possible to climb the spiral staircases and ascend to the roof of the castle, where you can enjoy a brilliant view across the entire grounds. You’ll see the green hills of Dover, the white cliffs, the choppy sea… and perhaps even France on a clear day! Once you’ve ascended the Great Tower, it may be a good time to poke through the extensive Medieval Tunnels (you’ll find the entrance by walking North from the base of the Keep). Dover Castle nearly fell to siege in 1216, and the tunnels were hurriedly built on afterwards to improve its defensive capabilities. Exploring them today, as they wind through the depths of the castle bedrock, you can soak up a little Medieval ambience. However, they’re ripe for improvement – more atmospheric lighting and more comprehensive interpretation plaques would make the experience a lot more involving. You’ll be glad to be out in the sunlight after exploring the tunnels, and now may be a good time to embark on the beautiful Walk of the Battlements, which takes in some impressive views of the sandy beaches of Dover. On the way round, for an even better view, stop off at the Admiral’s Lookout, which gazes out to France from the prow of the castle. Nearby are the 18th century Officers Barracks and Regimental Institute (now the cafe), built when Dover was preparing to defend England in the Napoleonic War. A seagull perches in front of the Officers’ Barracks, built in the c18th. And, so to the Secret Wartime Tunnels, the remnants of modern warfare in Dover Castle England. These tunnels spread across three layers in the cliff the southern aspect of the site, descending to the depths of 50m above sea-level (‘ground’ level is some 700m above sea-level). The middle level, codenamed ‘Casemate’ was built from 1797 and extended in 1941; the highest level, ‘Annex’, was built in 1941, and the lowest level, ‘Dumpy’ was built in 1942. The Tunnels – which have the distinction of being so haunted that English Heritage even organises ghost tours – played an incredible part in Britain’s efforts in World War II. It was from these tunnels that Vice Admiral Ramsay co-ordinated the spectacular 1940 rescue of Dunkirk, evacuating more than 338,000 troops from France in one of the finest moments of British history. As of Summer 2011, English Heritage has launched a major new exhibit, explaining the significance of the Tunnels in “operation dynamo” (the codename for the Dunkirk rescue), and leading visitors around the Military Hospital on the Annexe level. The significance of these creepy tunnels doesn’t end after WWII, though. In the Cold War, the British Government designated them to be a nuclear-shelter for regional government in the even of atomic apocalypse. Sheltering from the end of the world in these dank and claustrophobic passages is an absurdly depressing thought – we couldn’t wait to ascend to the surface after. How much time will I need to tour Dover Castle, in England? What sort of facilities are there? Of all the heritage sites we’ve visited, Dover Castle in England is definitely one of the best managed. You could spend the best part of a sunny day exploring the grounds: on a wet and windy afternoon in November, though, much of it is outdoors so it may be a little less appealing. You’ll find various shops, a restaurant, a little-land train to ferry tourists around the site, and extensive carparking. If you’re coming on public transport, it’s a (steep) 20min walk from Dover train station, or you can hop on a bus. The NAFFI Restaurant serves hot lunches and afternoon teas. And cake! The castle is well cared for by English Heritage, and it’s one of the biggest attractions in their portfolio. They’ve invested a lot of money: to 2011, £2.7m has been spent on the visitor experience in the Wartime Tunnels. In 2009, they lavished millions on restoring the Keep to reflect the colours and furniture of Henry II’s time. Any hints and tips for visitors to get the most of a visit? Sadly – and somewhat unusually for an English Heritage property – the interpretation around the site is really poor. There’s a very limited number of plaques explaining the history and context, and those which do exist are dated and often a bit tired. I’d definitely recommend buying a book to help you decipher exactly what you’re seeing, as there’s a real danger you’ll miss some of the most interesting bits. If you’ve enjoyed this page, why not discover the hidden treasure of Beeston Castle, another castle in England? Or you can read more about another one of England’s biggest castles – Kenilworth Castle. Why did a cold-blooded murder drive Henry II to build Dover Castle? What secrets and luxuries might you find in the mighty Keep? And what exactly lies in those deep passages beneath the castle? 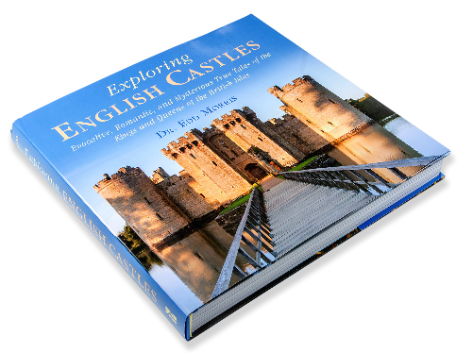 If you’d like to unearth more mysteries of Dover Castle, you need my first print book, Exploring English Castles. Discover the story of Dover Castle England, a formidable fortress that's guarded the country for years. Uncover tales of bravery - and subterranean ghosts.